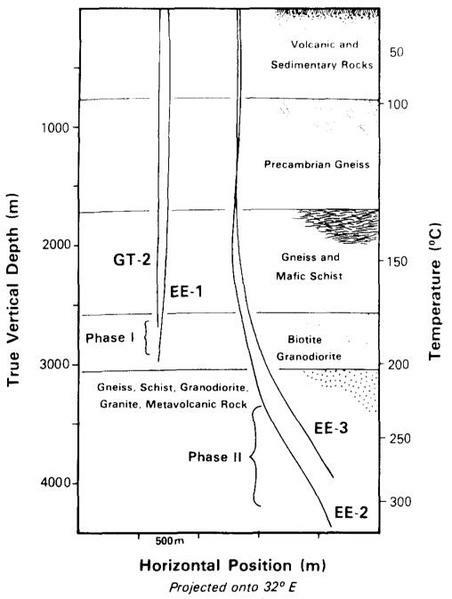 Simplified stratigraphic column of the Precambrian sequence at Fenton Hill. Also shown are the depth of the injection and production wellbores of the Phase I (GT-2 and EE-1) and Phase II (EE-2 and EE-3) reservoirs, and the approximate depth of the two reservoirs tested. 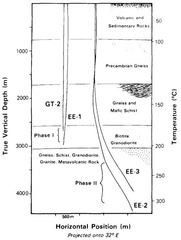 The temperature scale (right axis) is from a temperature log measured in wellbore EE-2. From Grigsby et al. (1989).